In the US, here have been some supply issues with Pardo Translucent Art Clay, but I’m happy to say that the ship has come in! Yes, indeed, the wholesale shipment of Pardo Translucent Art Clay has arrived in the US and stock has been sent to the suppliers who carry it. I spoke with Trish at Poly Clay Play last week and she has plenty of stock and even more on order. If you’re new to Pardo Trans, or need to buy some more for your own stash, here’s where you can get some. (Oh, and I don’t want to leave out the European polymer clayers! You can buy Pardo Translucent at Clayaround in the UK, Laurenz-Morgan and Marwel Design in Germany.) For a more comprehensive list of where to buy Pardo Translucent, see this post. I admit that I have hoarded my Pardo Trans. I like to keep some of all the polymer clay brands on hand so that I can test various products and techniques. And also because Pardo Translucent is the clearest of all the translucent clays, there is really no better solid clay to use in faux glass techniques. But now that more Pardo Trans is readily available, I’m happy to use up my current hoard. So, I’ve been making more faux sea glass, faux Roman glass, and faux Czech glass beads. Below I show you these examples of what can be made with my Faux Glass Effects Tutorial. Faux sea glass made with this technique is honestly quite convincing. How convincing? Check out this sea glass post where I mixed the faux sea glass among some real sea glass and you’ll be hard-pressed to know the difference. See that I mean? You will also learn how to make faux Roman glass. Quite the hot trend in jewelry design, actual Roman glass is expensive. This tutorial teaches you to make your own, and you can do it in any color you wish, with as little or as much iridescent sheen as your project needs. The third main project is faux Czech glass beads. You can make durable, lightweight faux glass beads in bright jewel-like colors that you can’t find in glass such as hot pink and grape purple. Next is faux carnival glass. You know that opalescent glass that you find in antique stores? That’s carnival glass. The same effect is used in those totally cool Czech glass buttons that have become popular used in jewelry designs in recent years. With this tutorial, you can make your own. The tutorial itself is 73 pages long and has 121 photographs that detail every step. This isn’t one of those “tell you the secret and send you on your way” type tutorials. 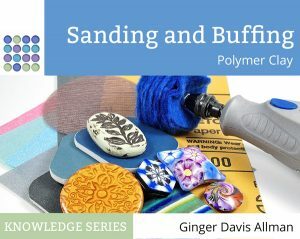 It’s really very thorough and gives lots of tips for working with clay, too. There’s also a resources section explaining where to get polymer clay supplies in your area. To purchase the tutorial, just click the button and be taken to the listing. After purchase, you’ll get an email with the download link. The whole process takes mere minutes and you can be making faux glass in no time. Note: Thanks to a special arrangement, this tutorial now contains a special coupon code for 10% off your order at Poly Clay Play. Yes, all of the work in these pictures is made from polymer clay. And you can learn how to do it with the Faux Glass Effects Tutorial. You can learn more about the tutorial here. Hi, I’m Nancy and I’m a Pardo hoarder too…maybe we all need a 12 step program to break the habit now. Only if we can have meetings. And learn to let go of those lovely little clamshell boxes by opening them and making beautiful things. See…we’ve got great ideas! They have had, yes. But I haven’t had an update from them recently. Anyone know if they also have a new shipment? I just got my order in of 10 packs. She said she made a huge order and has LOTS. Very nice lady. Oh good, that’s wonderful to hear! What fabulous photos! I could put these on a plate and have them for lunch! I ordered a batch of trans from Creative Journey…great service, fun people to deal with. I am a complete clay newbie…taking it slow…have the tutorial, still gathering clay colors, other accessories, and experimenting. Need an Atlas pasta machine…maybe in November, maybe wait for Santa. The Tutorial is great great great…thank you Ginger. Having been a technical writer (as in instructions etc) the work that went into this must have been awesome. The Pardo (both Translucent and white) I bought is so hard to condition – rather crumbly, too – is that normal for Pardo? I got it from polymerclay.de – they look like a reputable seller, but is my clay too old, perhaps? Breaking it into lumps is certainly not a problem, the problem is to make it pliable enough to work with. Would it be safe to use a drop of almond oil to mix in the clay – or would a pasta machine work better than my hands (which are quite strong, I actually see conditioning clay as hand-exercise, LOL). I have a pasta attachment for my Kitchen Aid (came with it, never used) – maybe I should dig it out? You asked for reviews for your tutorials – I’d love to write a proper review, but where can I post it? – your tips and tutorials are invaluable! Pardo can be a temperamental beast. It’s a very nice clay, but it doesn’t act like Premo, Fimo Soft, or Sculpey III…all of which are soft clays. Pardo is quite a bit more waxy. It’s often quite crumbly right off the block, and takes a bit of patience to condition. I find that it’s best to condition it slowly, using firm pressure, allowing it to mold and shape slowly. If you run a sheet of Pardo through the pasta machine quickly, it will often crack and crumble. But if you lie it on your work surface and slowly run a roller over it, you’ll get better results. It has to do with a scientific quality called shear strength. Remember silly putty? Remember how you could slowly pull it apart and it would stretch, but if you pulled quickly it would snap in two? This is kind of like that. Even when Pardo is fully conditioned, you might need to add a few drops of clay softener or oil, especially if your hands or the room are cold. And even then, it will always crack along the edges when you roll out a sheet. You should, however, be able to make the crumbs smooth together if you roll it in your hand, right? If the crumbs cannot be made to hold together with pressure from your hands, if the particles are more like sand than bleu cheese, then there’s something wrong with the clay. As for reviews, just go to the listing page (http://thebluebottletree.com/product/faux-glass-tutorial/) and click on the reviews tab. You can leave a review in the box at the bottom. Thanks! How you describe it works is exactly how mine reacts, so I’ll try again. Blue cheese is a good description – tha’s how mine is; not sandy – though less smelly than the cheese. Does Pardo translucent mix with Premo? Yes, Pardo clay is just like any other polymer clay. You can mix it with any other brand. Any tips for reducing plaquing of Pardo trans? I had a very soft block of yellow trans that conditioned wonderfully, but after baking, there were two 1/2″ plaque cracks below the surface of the clay. I tried to re-bake and plunge into cold water to heal what I thought, were two cracks, but nothing happened. I originally baked the pieces at 300 degrees for 45 minutes (15 mins to get back up to temp after placing in pre-heated oven). I have some tests running right now, but I strongly suspect the issue is related to high humidity. I get far more plaques in the spring and summer than in the winter. I have a dehydrator feature on my oven. I wonder if it would help to run that for a bit before cranking up the heat to cure. I will try it and report back! Hi and thank you for all the great tips and experiments you do for us. I just picked up my first batch of Pardo Translucent clay. I had seen many titles on conditioning it. I read through yours and then decided to see how my clay was going to behave. First I pressed the clay through the clam shell case and it dented nicely, similar to how I want any clay I buy to do. So I thought that was a good sign. Next I opened it up and broke a small corner piece off. It broke nicely with a bit of bend as it came apart. Then it was the full test and I started smushing it in the clayers manor, between thumbs and fingers. Mine was wonderful. No break or crumbles. I noticed that this article is a few years old. Has your experience changed with Pardo? Is it easier to condition than a few years ago? I’m glad mine is on the behaving side. I have stopped even looking at Kato clay. I have never had any that the work inconditioning was worth the slightly better review I hear of it. Always way too hard and very difficult to work with once I have finished the battle. No, my experience hasn’t changed. I work with Pardo extensively. But fresh bars ARE much easier to work with. If you have a fresh bar, enjoy!